Yes, it snowed all night and is snowing outside now -- can't believe it! Have a most lovely weekend, isn't the balloon photo gorgeous?! Gorgeous! Balloons are the best! I want to live in that bedroom. Such a gorgeous room. Have a good weekend! Happy weekend to you too !!!!! Love the balloons. Gorgeous, I could live here-if I knew the balloons weren't going to pop! Love the balloons! My co-worker got proposed to yesterday. She came home to a house full of blue balloons, and then he got down on one knee. Retelling the story she said, "And I just love balloons!" loving all the white! if i where to sleep in this bed i think it would feel like i'm on sleeping on a cloud. 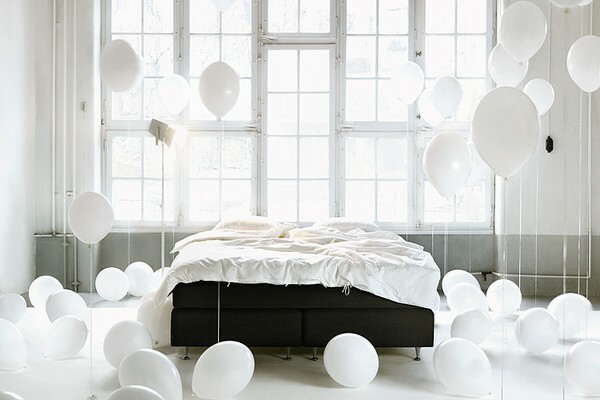 all i need to recreate this is a guy that will be willing to blow balloons up every morning for me. Such a beautiful photo! And that quote is such a positive way to look at things. Thanks for sharing! im a big fan of pia ulins work adn this pic is an all time fav..
oh i love this sooooo much! i love helium balloons (when they aren't killing whales). i would love to do something like this because i am so missing the snow in vancouver! we get hardly any!